After 29 distribution trips to 19 countries we thought we had a full understanding of the need for wheelchairs in the developing world. However, what we saw in Uganda was heartbreaking and has made us even more committed to providing mobility to those in need. 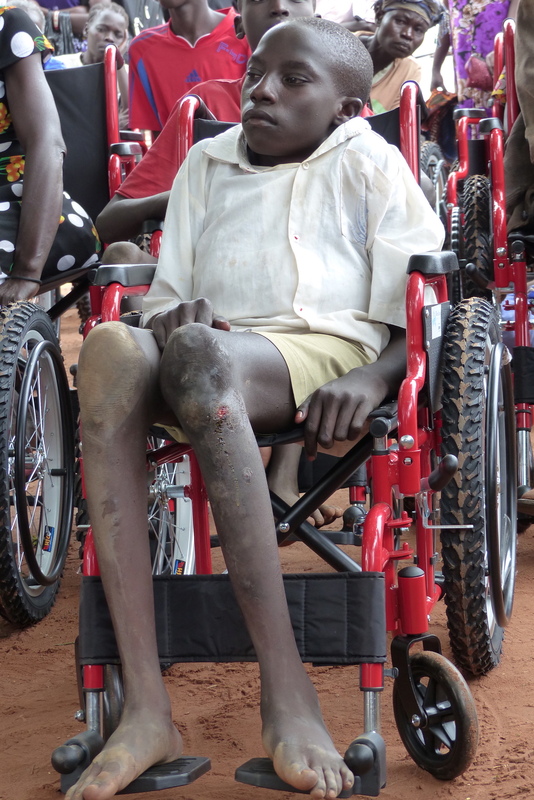 The incidence and the severity of people with disabilities in Northern Uganda was much more than anything we had experienced. We delivered approximately 100 wheelchairs in each of five regional towns where the local Rotary Clubs had preapproved each recipient. Word of the distributions spread and in every town there were 30 or 40 additional people who crawled (some for miles) to the distribution site hoping they too would receive a wheelchair. They didn’t feel entitled, they didn’t beg or get angry, they just sat there on the ground staring up at us hoping there would be an extra wheelchair. When we were done they crawled away, maybe it would be their turn next time. We were overwhelmed with emotion at our last distribution in the town of Arua (on the border with Congo). That day my son Josh and I made a commitment to each other that we would send more wheelchairs to Northern Uganda in 2018. The good news is that we were able to change the lives of 530 people (and their families) who had never had a wheelchair. The majority of the recipients have been disabled from birth and literally spent their entire life crawling, often for decades. We have hundreds of photos and nearly as many stories that we would love to be able to share. The two photos will give you just a small glimpse into the reality that we experienced. The boy in the first photo is from Gulu and his mother told us that he had become too big to carry and it was hard to keep his wounds clean. As you can see, he is neat and clean except for the obvious signs of a life of crawling. The gentleman on the ground sat right in front of us throughout the distribution in Soroti. He never said anything, just watched and listened intently. 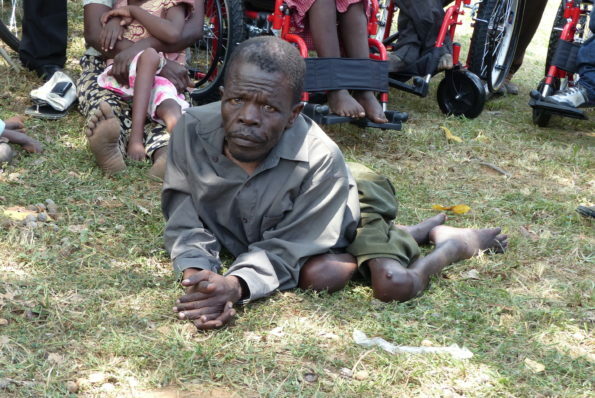 When the last wheelchair was distributed he quietly crawled away. Mobility provides freedom which in turn creates independence, dignity and hope for the future. It is hard for us to describe all of the emotions we have experienced but we know that none of this would be possible without your generous contributions. You can get a feel for our distributions from these short videos that were on Ugandan TV. We delivered 530 wheelchairs to Uganda in July. Our ‘From the Heart – Schools Project’ raised $61,000 and 20 teachers, students and parents distributed 280 wheelchairs to Argentina in June. We provided a $21,000 matching grant to the Rotary Club of Pleasanton who delivered 280 wheelchairs to Peru in September. $42,000 for a container of 280 wheelchairs for Northern Uganda. $21,000 to a fund that has been created for wheelchairs going to the hurricane victims in Florida, Texas and Puerto Rico and the fire victims in Northern California. $21,000 matching grant for a container of 280 wheelchairs going to the earthquake victims in Mexico. $7,000 to the Rotary Club of Pleasanton towards a container of 280 wheelchairs they plan to deliver to rural Chile in May. The cost to sponsor each wheelchair remains at $150. These are wheelchairs that retail for as much as $500 in the US but due to supply and demand in the developing world they can cost more than US$1,000 making wheelchairs an unattainable luxury for the vast majority of people. Last year 136 of you donated $71,082. In addition, our good friend and partner on the distribution trips, Bill Wheeler (owner of Black Tie Transportation) raised $15,380 bringing last year’s total to $86,462 exceeding our goal of $84,000. Thank you for your incredible generosity! This year our combined goal is $91,000. You can also make donations via credit card directly on the secure Wheelchair Foundation web site. Just click on this link and complete the required fields. Please be sure to complete the section that says “I would like to apply my donation to:” by clicking on either “Don & Josh Routh Wheelchair Projects” or “PwC Wheelchair Project”. Remember that 100% of your contribution goes directly for the program cost of manufacturing and transporting the wheelchairs. Josh and I, along with our fellow donor-guests pay all of our own expenses (airfare, hotel, meals, etc.) and our hosts in the receiving country (typically Rotary Clubs, Foundations, Ministries of Health, etc.) pay all taxes and tariffs along with the local distribution costs. Your donations are entirely tax deductible and you will receive a letter of appreciation along with a photo certificate from the Wheelchair Foundation (a 501c3) for tax purposes. Please contact me about Matching Gifts from your employer. For Matching Gift purposes it may be necessary to know that the Wheelchair Foundation is a subsidiary of the Behring Global Educational Foundation, a 501c3 (Tax ID # 94-3353881). You may also want to consider donating part of the Required Minimum Distribution (RMD) from your IRA without paying tax on the distribution (check with your CPA). As donors, you are always welcome to join us on one of our distribution trips. We can promise that it will be a life changing experience…and a lot of fun!